Active School Flag (ASF) is an initiative by the Department of Education and Skills supported by Healthy Ireland. It is awarded to schools who commit to developing and maintaining a physically active and physically education school community. As part of the process, schools aim to get active, more often. All children require 60 minutes of moderate to vigorous physical activity every day but only 20% or one fifth of Irish children reach that target. As part of the Active School Flag process, Scoil Bhríde will be developing four key areas: Physical Education, Physical Activity, Partnerships and our Active School Week. Introducing our Active School Committee for 2018-2019! We are excited to get started and plan some activities for the children and staff. Be sure to check our our Active School noticeboard in the hall where the Active School Committee will display any updates or announcements. An Active School Committee was elected with members from Junior Infants all the way up to 6th class. The Committee meets every Thursday during lunchtime to discuss and make decisions on how to make our school more active during the day. Our committee members are Harry, Mason, Matthew, Zoe, Danny, Callum, Erica, Elliot, Oisín, Roisín, Dylan, Emma, Sophie, Tara, Arvin and Corey. The Active School Co-ordinators in the school are Ms. Ryan, Ms. Murphy and Ms. Gleeson. Here are a list of some websites or apps which you might find helpful in keeping active at home. 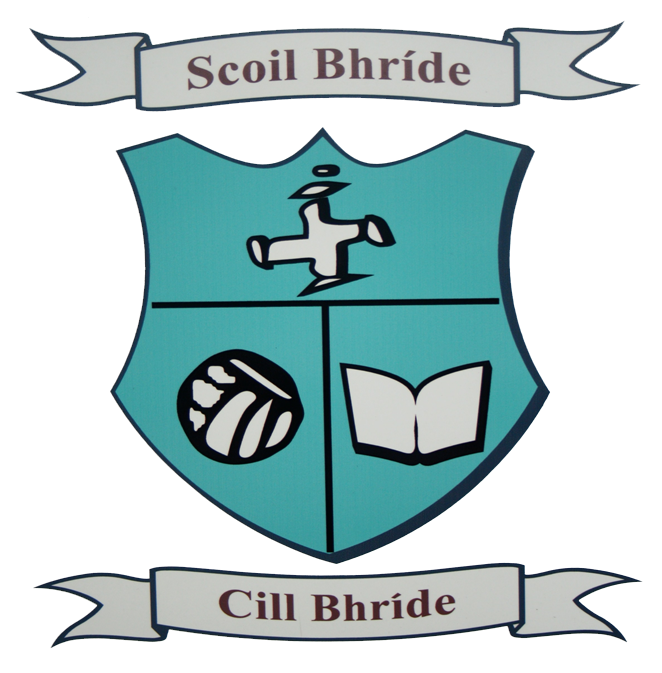 As part of The Primary School Curriculum (1999), pupils in Scoil Bhríde receive a minimum of 1 hour of timetabled physical education each week. On days when PE is scheduled, children can wear their school tracksuit and suitable footwear such as runners. Physical Education or PE is split into different topics or strands such as: Athletics, Games, Gymnastics, Dance and Outdoor & Adventure. As part of the process, the staff in Scoil Bhríde completed some self-evaluation and selected a strand of PE to focus on for the year. Throughout the school day, there are lots of opportunities for children and staff in Scoil Bhríde to be physically activity. collect 300 Aldi Rugby Stickers. The poster is now full and ready to be sent away. Pupils from the Active School Committee in 5th and 6th class tested our pupils knowledge by asking the all important question “What province did Paul O’Connell play for?” – the answer was, of course, Munster! 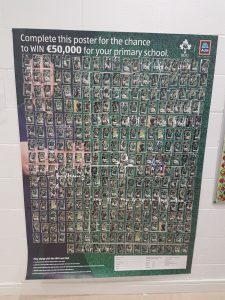 Our poster will now be sent away and we look forward to hearing if we have won any of the amazing prizes on offer. Active Schools Week 2018 was an enormous success. Many thanks to 5th class for organising the activities during the week and to 6th class for organising our Sports Day. We are already looking forward to Active Schools Week 2019!